When travelling in your RV, you will want to be able to use various water heating appliances such as a hot shower. To do this, you will require a compact RV tankless water heater that will be able to function in a small area inside the RV. The best RV tankless water heater is the Eccotemp-L10 Portable Heater, which is rated at 2.6 GPM and is able to run from at just 20 PSI of pressure. More traditional water heaters that use tanks are simply too big for the standard RV. 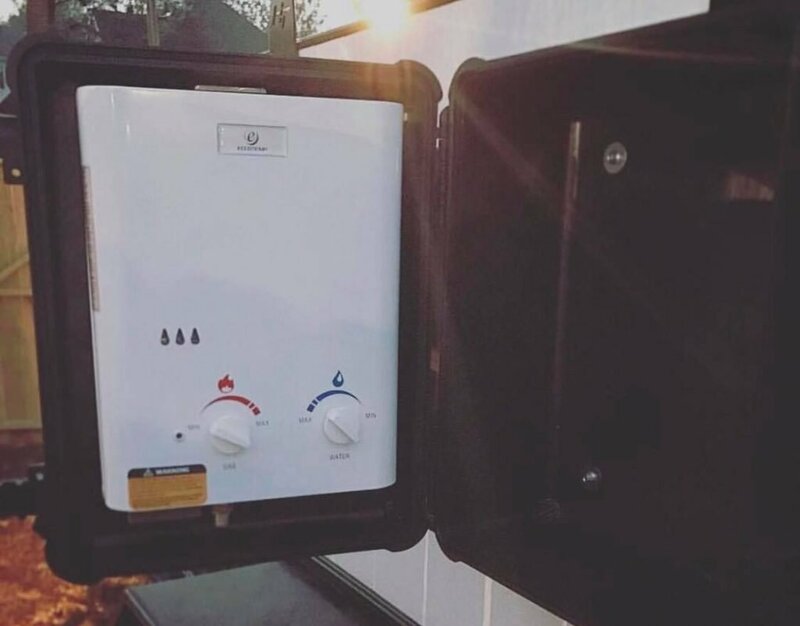 Therefore, using a tankless alternative will reduce its footprint inside the RV and provide a reliable method of providing hot water whilst on the move. In terms of the performance, gallons per minutes is a big factor to consider with the higher rating being more desirable. It refers to the amount of water that can be heated and output by the water heater per minute. Therefore the higher will result in a better performing shower. Some RV tankless water heaters will require more pressure than others. However, whilst out on the road, having access to a powerful water pressure is not always possible. Therefore, you will want to avoid those that require high PSI output for a more reliable source of hot water. 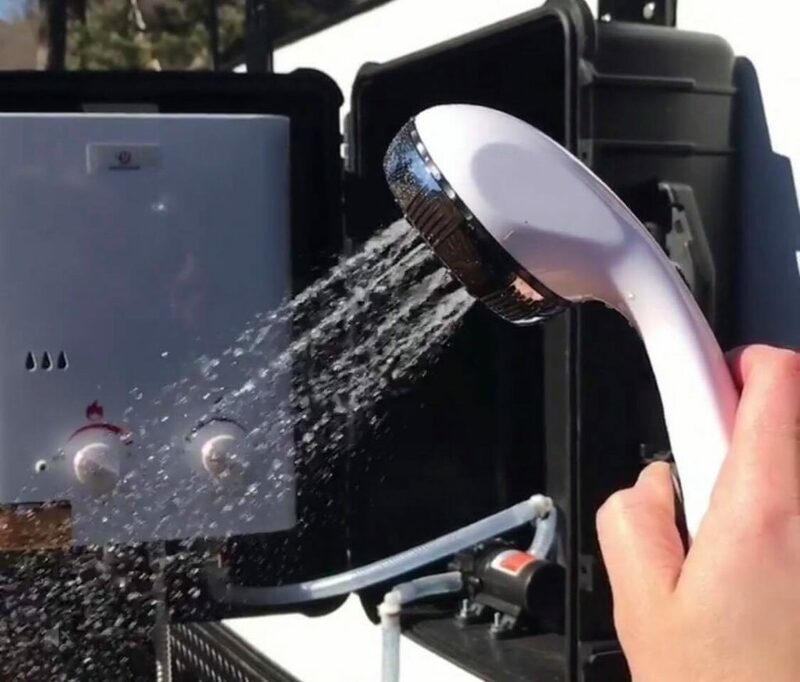 Below is a list of the best RV tankless water heater devices that will provide you with hot water whilst travelling on the road. The Eccotemp L10 is a compact and lightweight RV water heater that is ideal for anyone on the go for long periods of time. It is battery powered with an electronic ignition, which makes it very easy to power up no matter how far off the grid you are. It connects to a garden hose and does not require high water pressure, which also makes it very convenient. Here are all of the notable features of the Eccotemp L10 portable tankless water heater. Not only is the Eccotemp L10 very reliable for traveling, it is also very safe. The safety shutoff kicks in automatically when the unit is tilted more than 45 degrees in any direction, or when the heater has been on for more than 20 minutes. Overall, it is the best RV tankless water heater that offers excellent value for money and has the backing of reputable the Ecotemp brand. The PrecisionTemp RV-550 is another reliable tankless water heater that is perfect for use with an RV. It is designed specifically for use with small spaces like RVs and has the added benefit of not having a pilot light to worry about. Here are some of the features of the PrecisionTemp RV-550 water heater. This water heater is very efficient because it automatically adjusts the level of gas it uses, depending on the water flow and the temperature outside. It saves energy and it never wastes water either, so it’s ideal for the conscious consumer. While it’s not as compact as other RV water heater devices, the PrecisionTemp RV-550 is still designed for use with small spaces and will work well with your RV. The Girard 2GWHAM is a specifically designed RV tankless water heater with a compact design and easy plumbing attachments. It can handle cold weather, so you can use it all year round and it only requires 12 volts of power to work. Here are some of the features of the Girard 2GWHAM water heater. This water heater by Girard is a very reliable option for RV travelers. It is designed specifically for use for RVs and it allows you to efficiently heat water to use inside your RV. Since it doesn’t require much power or any special plumbing attachments, it is also very easy to set up. The Camplux tankless water heater is a very portable, sleek option that is perfect for any family on the go. It requires very little water pressure to start, which is why it is a great option for activities where you may not have access to a great water source. It is also very safe, with anti-freeze protection, a flame failure device, and oxygen depletion safety shutoffs. Here are some of the notable features and specs of the Camplux tankless water heater. This is a great option if you are looking for something very small and sleek to use while traveling in your RV. The Camplux water heater works in completely remote areas and has weather safety protection as well. The Sio Green IR260 is an electric tankless water heater designed for use while traveling. However, this water heater is unique in that it uses a patented technology to heat the water with a quartz elements. This means that the water does not come into contact with any metal or any other substances that could contaminate it. As a result, this reduces the buildup of any lime scale, algae, bacteria and ensures that you won’t need to do any maintenance on the heater. Here are the notable specs of the Sio Green IR260 water heater. In addition to being very environmentally friendly and safe to use, the Sio Green tankless water heater is also very small at just 5 x 8.5 x 3 inch inches. It’s perfect for RVs as it can fit underneath a sink or in a closet easily. Having a tankless water heater can make your life on the go in an RV so much easier. No more taking cold showers or constantly looking for public showers. A tankless water heater means you’ll have hot water on your own, no matter what the circumstances. However, not all tankless water heaters are suitable for life in an RV. Here’s what you should look for when shopping for a tankless water heater for your vehicle. When you’re traveling in an RV, you don’t often have much space to work with and each inch feels precious. That’s why it’s very important to consider the dimensions of your water heater before making a final decision. Measure the spaces in your RV where you could place a water heater and check to make sure that it can fit in there comfortably with a few extra inches to spare. Many people will make the mistake of simply purchasing the water heater without leaving any room spare. This is a big issue when it comes to installation as you will struggle to get tools around the edges and it. The more compact your heater, the better because you will be able to move it around as needed without much extra hassle. You will also need to consider what sort of power supply your water heater needs. Look at both the volts and amps required to run the water heater and make sure you are going to be able to consistently access enough power to run it. For some RVs, finding power isn’t much of a problem but in other cases it can be difficult to source enough electricity to run your appliances. Knowing the power requirements of your water heater before you install it can help you use your power sources most efficiently. Another important thing to take a look at is the water pressure requirements. These are usually listed in PSI. The higher the PSI, the more water pressure is required to run the water heater. RVs and even small cabins don’t often provide much water pressure, which can make it difficult to run a water heater. You should check the water pressure output of your RV before you start to shop for your water heater, so that you can rule out options that won’t work for your vehicle. Ideally, your heater should have very low water pressure requirements so that it can work with any vehicle. When you are on the go traveling in your RV, the last thing you want to have to worry about is fussing with a complex water heater. Ideally, your new water heater should have a quick and easy installation process that doesn’t require any technical knowledge. You should also look for a water heater that doesn’t require continual maintenance. This can be very annoying to have to deal with while you are traveling, particularly because you might not always have access to internet or other resources that would help you fix these problems. Everyone has their own preferences when it comes to the temperature of their showers, so it is important that you can easily make your heater warmer or cooler as needed. Many portable water heaters come with knobs on the front so you can switch the temperature of the heater with a quick flick of the wrist. Some heaters even come with a digital display so you can adjust the temperature with more precision and control. The gallons per minute (GPM), refers to the volume and speed of water your heater puts out. Generally, water heaters with a higher GPM are more effective, as they are more powerful and give you the option of a stronger shower if you want. A higher GPM output can also enable you to use two water sources at once. Small RVs can usually get away with a low GPM, but it will behoove you to look for a heater with a higher GPM number. When you’re on the go, it’s important to be aware of how much water you are consuming. Many water heaters make this easier by offering environmentally conscious features. For example, many water heaters today will only heat water as you use it, instead of having a constant supply of water that they are heating. This means you will waste less water and energy, which is much better for the planet. Additionally, you will save money on water and energy this way, as you will not be using as much. Water heaters are particularly helpful to have when you are living in a cold climate. However, you need to make sure the water heater that you purchase can handle changes in temperature and precipitation. Ideally, you should look for a heater that still works in the cold weather and is waterproof. Many RV-specific water heaters have this feature to accommodate for the many places you might be traveling to. When searching for a water heater for your RV, there are a few specific features that you need to look for. It’s important that you find a heater that is compact and durable enough to handle life on the road. It also needs to be powerful enough to provide you with hot water when you need it – without being wasteful. Use this guide to help you find the best tankless water heater for your RV, so you can stay comfortable and clean whilst you’re traveling. Before purchasing any water heater for your RV, ensure that you have taken the correct measurements beforehand. Once you have these measurements, you will want to ensure that you will have space around the heater to allow the an easy installation. All of our recommended RV tankless water heater devices within this article are suited for a range of budgets. However, you will want to consider factors such as the size (as discussed above), the pressure required and the power you desire.